Welcome to April's installment of the regular, bite-size, data-focused updates I am sharing with Meta! You can check out previous posts by me if you like, as well as March's post from my coworker Donna. Yesterday, we launched the results of the 2019 Developer Survey; you can read about everything from hours worked per week to issues around underrepresented groups in tech. During my time analyzing the survey data, I found more interesting results than we had space to include in the main report. This month seems like a great time to share one of those here with you all on Meta! The salary information that we gather in our annual survey is some of the most valuable data in the whole thing, because this gives us a specific insight into our industry that we can't really collect in any other way. We can combine salary data with other characteristics of respondents to build a deep understanding of how developers earn. We use exactly this kind of information for the statistical modeling behind our salary calculator, which will be updated in the upcoming months to use 2019 data. Globally, how do we we see experience, salary, and developer role interact? This plot shows the global median annual salary in USD on the y-axis; check out the methodology section of the main survey report for details on how we converted local currencies used by respondents to USD. The x-axis shows years that respondents have been coding professionally. For this plot, I chose four developer roles to highlight from across the industry, although we do have this data for many other roles from designers to mobile developers. What are some things we can notice from this plot? 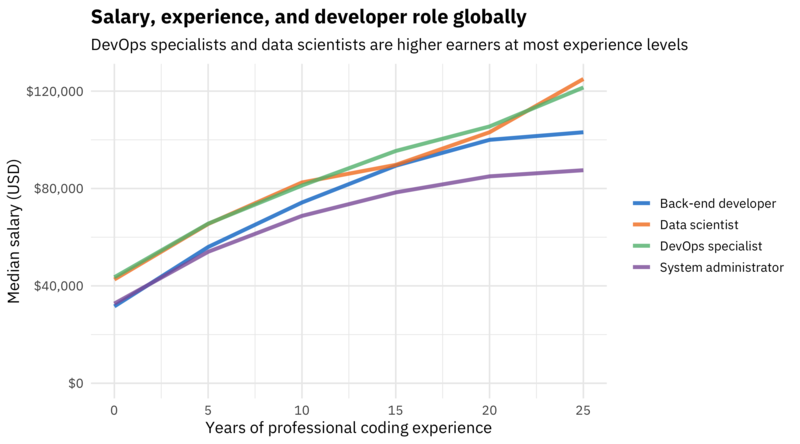 As expected, more experienced people who code earn more, across the board. Salary typically is increasing fastest for early-career developers. Folks who work in data and DevOps are high earners, not only in absolute terms, but also at a given experience level. Data science and DevOps roles are somewhat newer, at least framed in those ways with those titles, but we see that some of the people in those roles have been coding for a long, long time. These folks earn a lot. The relative shift in salary from early to mature career stage for back-end developers compared to system administrators is interesting, and I would love to know how this develops moving forward. It's important to remember when looking at a plot like this that we are seeing it today; it's a bit more like looking into the past than looking into the future, in terms of salary trends. What are your thoughts? This analysis uses survey data that will be publicly available under the Open Database License soon, so you can reproduce this for yourself if you like, or dig into further details. In the meantime, you can check out our previous years' results. Do you have topic ideas for future data science explorations? Browse other questions tagged discussion featured survey-2019 data .